Anon. sale, Sotheby's New York, 15 November 1989, Lot 73. M. Loreau, Catalogue des travaux de Jean Dubuffet, fasc. I: Marionnettes de la ville et de la campagne, Lausanne 1966, no. 325 (illustrated p. 174). J-L. Daval, L'Art en Europe: Les Années Décisives 1945-1953, Geneva 1987, p. 310 (illustrated in colour p. 121). D. Picard, 'St.-Etienne résolument 20e', Connaissance des Arts, December 1987, pp. 122-123 (illustrated in colour). M. Loreau, Catalogue des travaux de Jean Dubuffet, fasc. I: Marionnettes de la ville et de la campagne, Paris 1993, no. 325 (illustrated p. 202). Paris, Galerie Denise René, L'art en Europe. Washington D.C., The Hirshhorn Museum and Sculpture Garden, Jean Dubuffet 1943-1963: Paintings, Sculptures, Assemblages, June-September 1993, no. 9 (illustrated in colour p. 52). "In my paintings I intend to show all the things that haunt my thoughts and I refuse myself such constraints as those imposed by visual perspective which limit my freedom. I want to portray the garden that lies behind a house, the part that, if you were to look at it from the front, remains hidden by the house. Therefore, I will paint the house properly from the front, but also the garden that lies behind it - as it would look from the front - or adjacent to it according to the circumstance. And I will paint it in such a way that the viewer understands how it is that the garden exists behind the house, and also the embarrassment that the painter has come across, and how through improvisation he has finally resolved the problem." (Jean Dubuffet, cited in M. Loreau, Catalogue de travaille de Jean Dubuffet, fasc. I: Marionnettes de la ville et de la campagne, Lausanne 1966, p. 170). In 1942, in the midst of the Nazi occupation of France, Dubuffet decided to leave his wine business and begin painting. In what was undoubtedly at some level a reaction to the cultural crisis of the times, Dubuffet sought to produce an art of rudimentary values that was untainted by what he saw as the corruption of the lofty and artificial values of so-called civilization. He proposed an ordinary art for the ordinary man that depicted ordinary views of everyday life. Inspired by the example of artists like Klee and Miró, who had also responded to similar sources, Dubuffet embraced what he called an 'Art Brut', or a 'raw art', such as that produced by children or the mentally insane. "I liked the kind of painting that children make," Dubuffet remarked, "and aimed at nothing more than to make equivalent ones, for my sole pleasure. I believed that paintings deprived of technique like those made by children, effortlessly and quickly, can be as effective, even more effective than paintings produced in the cultural circuit, and that they can also be carriers of unexpected bonuses offering novel overtures to thought." (Jean Dubuffet cited in, ed. S. Nash, Picasso and the War Years, London 1999, p. 109). Maison de Campagne of 1944 is a major example of Dubuffet's new approach to painting. 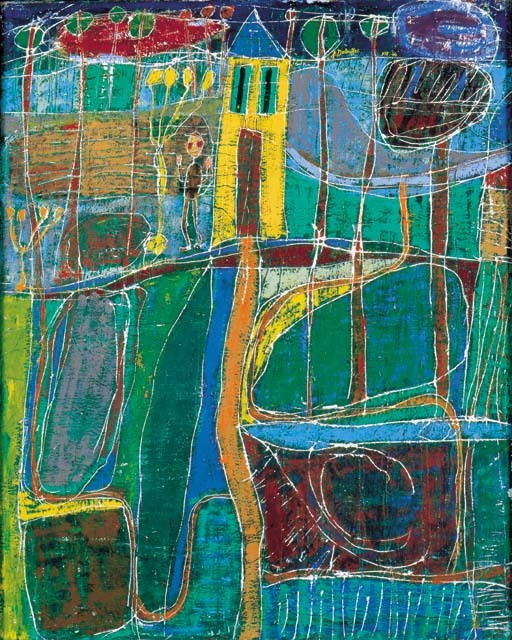 Depicting a man standing outside his house alone in a landscape that is composed almost solely by the raw colours of the earth tall thin balloon-like trees, Dubuffet creates a unique world that, in the same way as a child's drawing, views the world from a fresh and illuminating perspective. The banal subject matter, deliberate clumsiness of execution and striking use of raw semi-naturalistic colour in Maison de Campagne create a powerful evocation of the simplicity of life that transforms this ordinary scene into something extraordinary. "Personally I am not interested in what is exceptional and this extends to all domains," Dubuffet asserted. "I feed on the banal. The more banal a thing may be, the better it suits me. Luckily I do not consider myself exceptional in any way. In my paintings, I wish to recover the vision of an average and ordinary man, and it is without using techniques beyond the grasp of an ordinary man.... that I have tried to constitute great celebrations. Celebrations (or feasts) are much more highly prized when, instead of setting themselves apart on foreign soil.... They occur in everyday life. It is then that their virtue (to transform our daily life into a marvelous feast) is effective. I am speaking of celebrations of the mind; please may it be understood: celebrations of humours and deliriums. Art addresses itself to the mind, not to the eyes. Too many people think that it addresses itself to the eyes. That is to make of it poor use.... Similarly, the most simple and common spectacles appeal to me the most... I am a tourist of a very special kind: what is picturesque disturbs me. It is where the picturesque is absent that I am in a state of constant amazement." (Jean Dubuffet cited in, ed. H. Damisch, Prospectus et tous écrits suivants, vol. II, Paris 1967, p. 62). Yet despite Dubuffet's attempt to emulate the freshness and innocence of children's art, like many other artists before him, he is ultimately unsuccessful. Trying to paint like a child can never be the same as painting like child. The high horizon line and absence of perspective in the present work reveal as much about Dubuffet's fascination with the colour, material and texture of the earth - a subject which was to dominate his art for much of the next fifteen years - as they do his desire to rediscover the innocent unsophisticated gaze of the child. In order to untrain his hand, Dubuffet has used broad sweeps of garish oil colour liberally applied with a dry brush so that it covers the canvas in a rough crayon-like manner. Before applying the paint he has destroyed the regularity of the flatness of the canvas by covering it with a thin uneven layer of plaster into which, after painting, he has incised the outlines of the landscape with a long thin pointed instrument so as to remove any impression of skill. These languid incised lines give the contour-like forms of the work a natural fluidity that is wholly appropriate to its primarily organic subject matter. In its exploitation of the texture and surface of the work this charmingly vibrant painting anticipates the strongly textural paintings Dubuffet would embark upon and the end of the 1940s. Ultimately however, Maison de Campagne is most remarkable for its primitive colours, which Dubuffet has used in a quite remarkable and deliberately unsophisticated way. Clashing one garish hue against another in a magnificently perverse and brutal way Dubuffet has, like an eccentric tapestry maker, woven these unusual shapes and colours into a delightfully vibrant and strikingly cohesive whole.